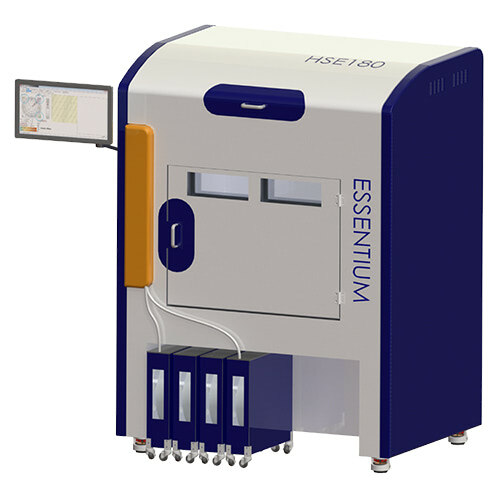 This is the Essentium HSE 180 S with High Speed Extrusion technology. HSE enables you to print end-use parts that are on par with injection molding strength. It works like this: while the part is being printed it’s hit with electromagnetic energy in the form of a high energy plasma. This makes sure the polymer chains in between the layers have sufficient time and temperature to heat and bond. This provides a z-strength that is on par with the x and y-strength. – Closed loop multi-axes servo control, not only for x y and z but also for the extruder motor and heater access. – Closed and heated print chamber. – FlashFuse extruder system (Single or twin IDEX optional).